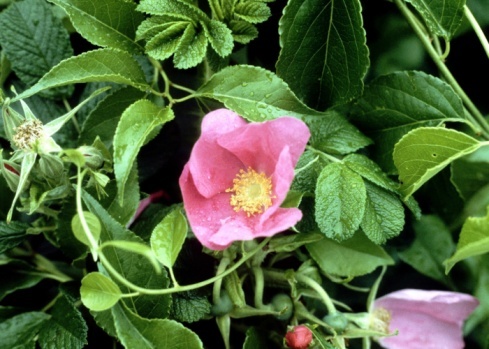 Scientifically known as the Rosa rugosa, the beach rose is a sturdy, easy-to-grow shrub that enjoyed by landscapers and home gardeners alike. Not only are beach roses cold-tolerant and disease resistant, they will also withstand conditions that would send most rose bushes into a full wilt. They thrive in poor soil, salt air, windy environments and full sun. However, while they don't require the attention other rose bushes demand, they do need periodic trimming to look their best. Pruning beach roses eliminates old, unattractive or damaged wood, while promoting the growth of new foliage and flowers. Beach roses thive in colder climates. Examine the rose bushes prior to the spring growth spurt. Not only will the beach rose recover more quickly from pruning during the dormant period, it will make spotting unwanted canes easier as there is bound to be little, if any, foliage on the branches. Remove any branches that have been killed by frost. These will be a dull brown color and will have no buds or new growth on them. Hold the pruning shears at a 45-degree angle and cut the branch, removing as much of the dead plant tissue as possible. Cut the branch back to the base of the shrub, if necessary. If you're not sure where the dead wood ends and the healthy growth begins, simply look at the center of a cut branch. Living canes are white in the center, while dead canes are brown. Trim any damaged canes, cutting them back to the place where they connect with larger branches. Additionally, remove any branches that are growing inward, toward the heart of the plant, rather than out toward the open air. This thins the shrub and allows air to circulate more freely around the branches, which helps to discourage the development of diseases. Eliminate crossed branches by cutting away the smaller of the two. If left unattended, the canes will rub against each other as they grow, damaging the protective bark and leaving the shrub vulnerable to invasion by pests. Examine the base of the shrub. Locate the bud where the branches emerge from the roots and trim away any growth found below this nodule. These offshoots are known as suckers and their development drains the energy resources of the plant. Sculpt and shape the shrub, if desired. Cut the canes back, removing up to one-third of each branch to control height. Alternatively, you can remove whole canes, cutting them completely back to the base of the shrub, to control the width. Take care not to remove more than 30 percent of the total plant material.